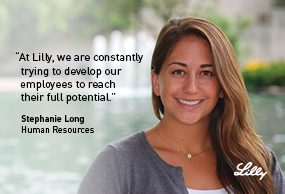 By being hired into one of our Management jobs at Lilly, you’ll be a key member of the Lilly team. Professionals in Management careers come from a variety of backgrounds, bringing an assortment of knowledge and skills to every area of our business. Please click on your desired Management job to learn more about the exact qualifications. A Management job at Lilly may be waiting for you! Company Overview At Lilly, we unite caring with discovery to make life better for people around the world. We are a global healthcare leader headquartered in Indianapolis, Indiana. Our 39,000 employees around the world work to discover and bring life-changing medicines to those who need them, improve the understanding and management of disease, and give back to our communities through philanthropy and volunteerism. We give our best effort to our work, and we put people first. We’re looking for people who are determined to make life better for people around the world. Responsibilities Manage all group activities of up to 15 analytical QC staff, which may include supervisory levels. Plans work for the group to respond to changing priorities. Maintains a safe, orderly and compliant work area according to company safety standards and cGMP regulations. Assists with workload, as needed. Effectively represent the company with FDA and other Regulatory Agency officials related to QC expertise, as needed. Direct all group activities of up to 15 QC staff, which may include supervisory levels. Take full responsibility for deliverables of the QC Bioassay team, which includes routine testing to support product release, stability, and process validations. Oversee routine and non-routine analyses of test articles by methods such as residual impurity by ELISA and qPCR, potency determination by ELISA and cell-based methods. Manage the critical reagent, reference standard, and product control qualifications. Monitor workload distribution, re-prioritize as needed and ensure completion of all tasks. Identify analytical projects required to achieve group and corporate objectives. Plan and coordinate implementation of desired outcome(s). Work independently but ensure communication of critical information upward with buy-in from senior management for key decision-making. Evaluate coach and manage personnel performance. Set team group objectives, monitor progress, and be accountable to commitments. Participate in the budget process. Monitor group spending to remain on track with budget. Take initiative to make things better for the company, be aggressive with your work and assertive in your interactions, lead by example and foster collaborative relationships. Serve as a technical expert on the bioassay related methods performed in the group and the results obtained. Strong knowledge of analytical trending programs to evaluate and investigate data to detect product or method-related trends. Use technical knowledge, understanding of policies, remain current on regulatory and industry trends to make sound decisions that serve and move forward the business. Use scientific expertise to provide assistance to team with troubleshooting, laboratory investigations, problem resolution and implement process improvements. Apply strategic-thinking and forward planning with high level of ownership/accountability. Assure adherence of acceptable cGMP practices by staff during execution of all work tasks. Review test results for conformance with specifications and effective documents. Represent the company through effective interactions with FDA officials, as needed, related to QC expertise. Proven competence in area to manage with at least 10 years of technical experience in protein product. Experience in monoclonal antibody is not required but a definite asset. Ability to take initiative, to be assertive, to lead by example and to build relationships. Strategic thinking capabilities to advocate and move the business forward. High level of ownership/accountability. Additional Information Lilly is an EEO/Affirmative Action Employer and does not discriminate on the basis of age, race, color, religion, gender, sexual orientation, gender identity, gender expression, national origin, protected veteran status, disability or any other legally protected status.